Simon & Schuster Books for Young Readers, 9781416990680, 496pp. From the Flying Start author of Amy & Roger’s Epic Detour comes a powerful novel about hope in the face of heartbreak. Taylor Edwards’s family might not be the closest-knit—everyone is a little too busy and overscheduled—but for the most part, they get along just fine. Then, Taylor’s dad gets devastating news, and her parents decide that the family will spend one last summer all together at their old lake house in the Pocono Mountains. Crammed into a place much smaller and more rustic than they are used to, they begin to get to know each other again. And Taylor discovers that the people she thought she had left behind haven’t actually gone anywhere. Her former best friend is still around, as is her first boyfriend—and he’s much cuter at seventeen than he was at twelve. As the summer progresses and the Edwards become more of a family, they’re more aware than ever that they’re battling a ticking clock. Sometimes, though, there is just enough time to get a second chance with family, with friends, and with love. Morgan Matson is a New York Times bestselling author. She received her MFA in writing for children from the New School and was named a Publishers Weekly Flying Start author for her first book, Amy & Roger’s Epic Detour, which was also recognized as an ALA Top Ten Best Book for Young Adults. 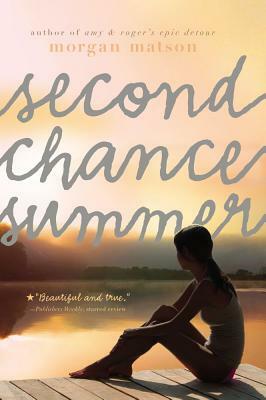 Her second book, Second Chance Summer, won the California State Book Award. She lives in Los Angeles. Visit her at MorganMatson.com. *"Matson has blended romance, humor, teen angst, boring summer jobs, and a truly tragic event into a wonderfully readable story, told in a manner that trusts teens’ intelligence. Jenny Han’s and Sarah Dessen’s fans will gobble this up." “The exploration of the father-daughter relationship is warm, sensitive, and heartbreaking, with Taylor realizing how much she counts on the man she’s going to lose. Between the dreamy romance and the four-hankie family story, this is a satisfyingly emotional summer tale." *"Matson writes subtly about complex family dynamics, grief, and the impending loss of a parent in a way that is both beautiful and true...Readers who love the work of Sarah Dessen and Jenny Han will feel intensely for this cast of vulnerable characters who demonstrate integrity, personality, and perseverance as they work to bridge the distances between them." "[Second Chance Summer] is a sweet, well written coming-of-age book that pulls at the reader’s heartstrings...This is a compelling story that reads fast and grips readers until the very end." *"This is a bittersweet, powerful tale of family devotion, the sustainability of true friendship, and the silent courage of loving someone enough to stay and watch them die." "One of the most touching, irresistible, and feel-good road trips I've been on in a long, long while. AMY & ROGER is a book to love." * "A near perfect summer read that should leave readers with a thirst for travel and romance." "This entertaining and thoughtful summertime road trip serves up slices of America with a big scoop of romance on the side."